Introduction: Achalasia is defined by esophageal dysmotility and obstruction. Over time, obstruction may result in esophageal elongation and angulation of the distal esophagus. 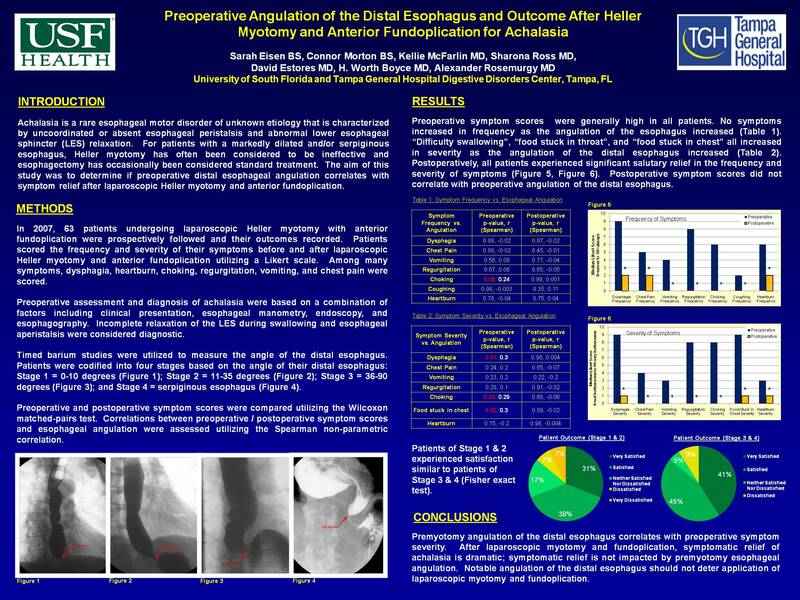 The aim of this study was to determine if preoperative distal esophageal angulation correlates with symptom relief after laparoscopic Heller myotomy and anterior fundoplication. Methods: 63 patients undergoing laparoscopic Heller myotomy with anterior fundoplication in 2007 were prospectively followed and outcomes recorded. Patients scored their symptoms (i.e. dysphagia, heartburn, choking, regurgitation, vomiting, chest pain) before / after myotomy utilizing a Likert scale (0=never/not bothersome to 10=always/very bothersome). Preoperative Timed Barium Studies were used to measure angulation of the distal esophagus. Results: Symptoms improved with myotomy (Table). Premyotomy angulation of the distal esophagus impacted symptoms before myotomy but not after myotomy (Table). Discussion: Premyotomy angulation of the distal esophagus correlates with preoperative symptom severity. After myotomy and fundoplication, symptomatic relief of achalasia is dramatic; symptomatic relief is not impacted by premyotomy esophageal angulation. Notable angulation of the distal esophagus should not deter application of myotomy and fundoplication.